Gorgeous Canadian hand-crafted full log home located in the beautiful High Timber Ranch area of Big Bear Lake. This property offers the best in luxury mountain living offering 3 master suites, an impressive modern kitchen, and spectacular treetop views from the massive 1600 square foot main deck. The center of the home features an impressive floor to ceiling stone fireplace perfect for family gatherings on a snow winter night. Out back, there is plenty of room for sledding and snow play including a tree house/workshop for kids to enjoy. High Timber Ranch is at the highest elevation in Big Bear receiving more snow than the village and lake area. From this location you can access bear mountain ski resort within a 5 minute drive. The lake and village are about 10 minutes away. Built as a dream mountain estate, this home has some unique features (like moose antler chandeliers and radiant floor heating). 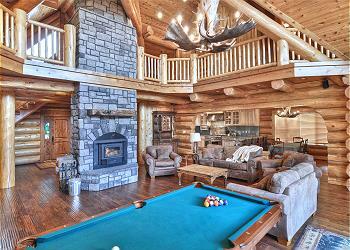 You will not find a more luxurious log home in Big Bear.